I recently had an exciting experience of appearing on the morning show Colorado & Company alongside Boys Hope Girls Hope executive director Mary Fran Tharp. 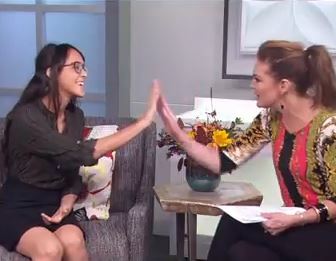 It was my first time being interviewed on television and it was eye-opening and a little nerve-wracking. I was there representing all the scholars of Boys Hope Girls Hope and I took the responsibility seriously. It was broadcast live so I didn’t want to make a mistake. The newsroom was a very fast-paced environment and it was interesting to see everything behind the scenes. I was asked many questions about how Boys Hope Girls Hope has helped me throughout the years. These questions were easy to answer since Boys Hope Girls Hope has always been there for me. I started with BHGH as a freshman and didn’t know what to expect. As a junior, I see how much this organization has helped me achieve my goals and get college-ready. When I go to Boys Hope Girls Hope, it’s always a welcoming environment where I can rely on my peers and BHGH staff to help me with whatever I need. This has included taking me on college tours (my favorite so far has been the University of Northern Colorado). We have also done a lot of volunteering in the community; most recently we served dinner at Denver Rescue Mission and I loved being able to affect others in a positive way. Boys Hope Girls Hope has also introduced me to summer programs that helped me develop my skills in business management (JA Business Week) and leadership qualities (through RYLA). Boys Hope Girls Hope has helped me become an efficient time manager by providing an environment to study and tutors when I need them. I use these time management skills to serve as junior class president and Speech and Debate club president. I am also a member of the swim and track teams and National Honor Society and National Art Honor Society. BHGH has given me a strong sense of community and this is what I will really miss when I graduate from Aurora Central High School. It has really gotten me to think about my future and college. I hope to be a film director someday and seeing the bright lights at Colorado & Company has reinforced this for me.